It might have escaped your attention that data journalism is huge, since about 5 years and more. This just means the RV drove at these speeds, means nothing about RY pace. We need Tomtom GPS data ! I agree with disagreer, I think it's a very damning graphic, and easy to understand. Besides just all the miles under 7:00, there is the simple fact that Rob's and Joe's graphs look *very different*. Joe's is how it is supposed to look, and Rob's is nothing like that. Even if you don't understand what you are seeing any deeper than that, it is still informative. 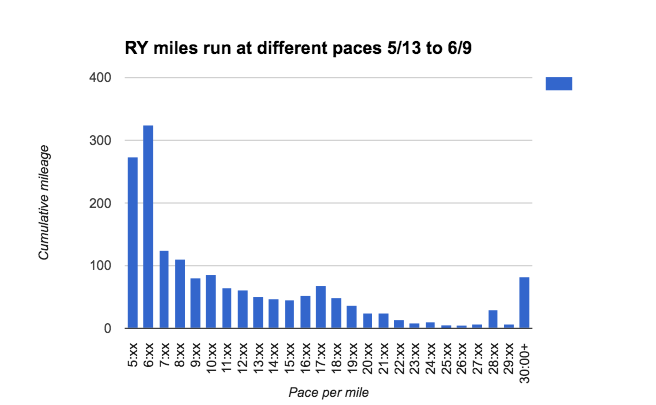 Are there any other multi-day runners from whom we could get pacing data, and build histograms? Having a couple of legitimate multi-day runners all with very similar histograms, being compared to Rob's which is very different, would be even more convincing. mmm, I wonder what other mode of transportation he could have used on those bike trails putting down miles at PR pace? oh well, nothing comes to mind, so he must have been running, case closed. Except that Rob has claimed that the tracker was almost always with him, and only in the RV when he was separated from it "maybe up to five times" if I remember right. (Can somebody track down where Rob said this?) So at the very least Rob has to choose between admitting he was lying about that, or admitting that his run followed this highly implausible pace distribution. RE: Joe Fejes 6 Day 6/23/2016 2:41PM - in reply to Lance wannabe. I also had wondered if he covered the bike trail on bike, but I didn't remember them mentioning one. But they did have one. Blog for Day 1. Dustin scouted out an offroad path for Rob on bike, and you can see the mountain bike in the bottom picture. Pretty sure this is why the nazis lost. The first marathon distance isn't close to PR pace and he fades badly at the end of it. Pretty sure he legitimately ran that one just fine. It's all the marathons starting on day 4 and beyond where he magically is faster than he was the very first day... that's what's questionable. If we want to protect our sport from cheaters then we need to take action. It isn't enough that we have enough circumstantial evidence to say he is a cheat, we need to go out there and make the masses don't fall for this any more. Please take the time, write an Amazon review! He will sell less books, and won't be seen in the same light. We need to focus on the dopers, not these 3 hour marathoners or stunt runners in order to protect our sport. No one cares about these slow blokes. Thanks for dropping in londoncalling. Very interesting, looks like he's been at this a long time. No sense in doing anything about the dopers. If all dopers got banned then athletics on planet earth would come to a grinding halt. We still have to through a few non-essential dopers under the bus every once in a while to justify the ineffective drug testing.